Whether you’re munching on a bowl of granola or slurping on a cup of noodles behind the wheel, it still counts as distracted driving through the eyes of police. According to the BC RCMP’s ongoing awareness campaign this month on what qualifies as distracted driving, snacking is a prime example. In case you were not aware: “Distracted driving” literally means anything that distracts you from the road and the task at hand of driving safely. 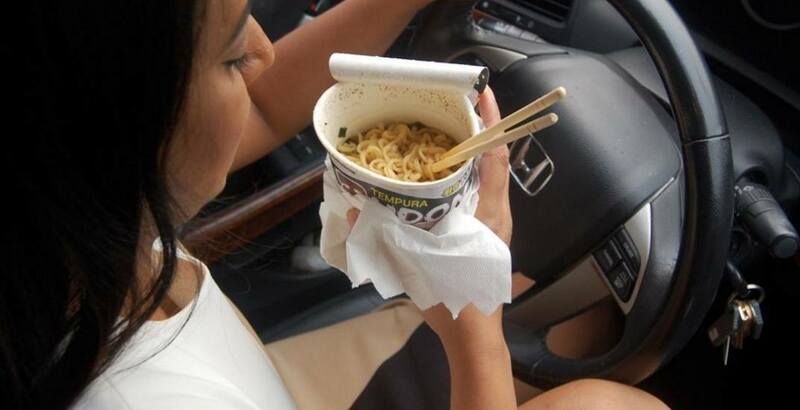 In a tweet posted by the BC RCMP’s Traffic Twitter account earlier today, a photo of a driver eating a bowl of instant noodle soup while operating a vehicle highlights how a driver’s judgement is compromised when they are not fully focused on the road. In fact, if a driver is caught in the act, it could lead to a $368 fine and 6 driver penalty points on their record. While various law enforcement campaigns have mainly focused on cell phone use – texting and making calls – as the prime example of distracted driving, the RCMP’s website states other forms include reading books and maps, using a GPS, watching videos or movies, smoking, personal grooming, adjusting the radio/CD, using earphones, and playing extremely loud music through the speakers. Police advise that smartphones should be out of reach to reduce the temptation of using it. When it comes to eating and drinking, it is best to avoid this practice while driving, but if you must take a drink wait until you are stopped at a red light.